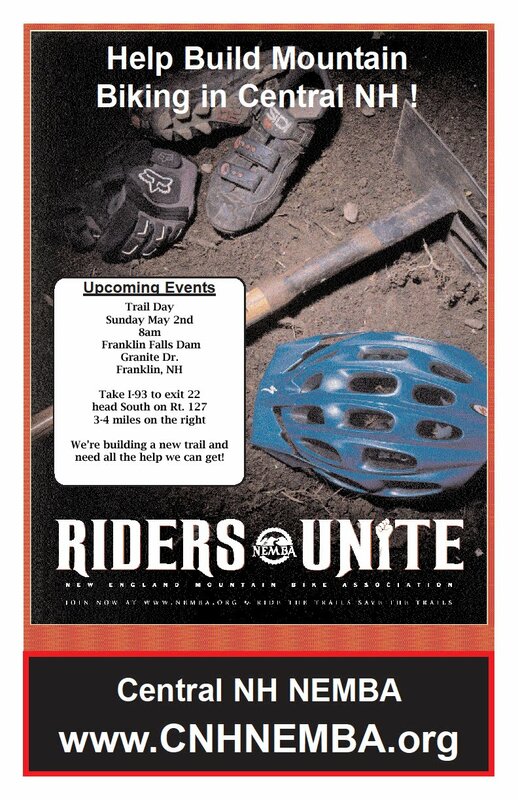 CNH NEMBA: Trail Day Sunday May 2nd! Be a part of building a brand new trail! Take it from us there is nothing quite like riding a trail that was created with a little bit of your own elbow grease. We will meet at 8am and work until about Noon or 1pm and then we will have a cookout afterwards and possibly a ride, time permitting. I've had a chance to walk the flagged route for the new trail and I'm super excited. It will start by Rusty Bucket, wind down the hill to Salmon brook, then come out over by Lost Wall. It'll have rolling bench cut, switchbacks, big rocks, and lots of awesome! We will have lots of tools, but feel free to bring your favorite McLoed, pulaski, mattock, rogue hoe, gravel rake, tamper or shovel.